<> Subwoofer Boxes - Truck Sub Boxes - GMC - Page 1 - Sound Off Audio, Inc.
We make custom boxes for all years of GMC trucks. 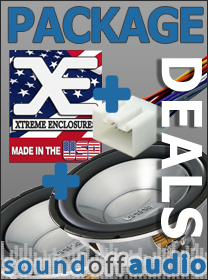 We offer a large selection of sealed and ported subwoofer enclosures which we've designed and built. We have tested the custom fit of our speaker boxes in the GMC trucks before making them available to you. Call or text 850-674-6363 for any information.